So a couple of weeks ago, someone gave me a giant bag of fingerling potatoes. You know, those creepy and delicious little potatoes that look like various body parts? They were starting to sprout and some of them were going bad (um, can we talk about how rotten potatoes are pretty much the worst thing in the universe? Because wow. ), so I needed to get on it. So I started experimenting with different flavors and methods for cooking these delicious little treasures and this kind of came out as our family favorite. I love that they take less than 30 minutes to cook, that you can serve them with breakfast or lunch or dinner, that they go with just about everything, that my kids love them, and that they’re super hands off, so I can work on whatever the main attraction is. Or do the dishes. Or check Facebook. Whatever. You’re going to need a pound of fingerling potatoes. Sometimes fingerlings are cheap and super easy to find and sometimes you may be required to offer up your firstborn child in order to purchase them. So. Since we’re not proponents of selling people for food, if these are just too expensive or hard to find, you can always use baby red or yellow potatoes, the smaller the better. 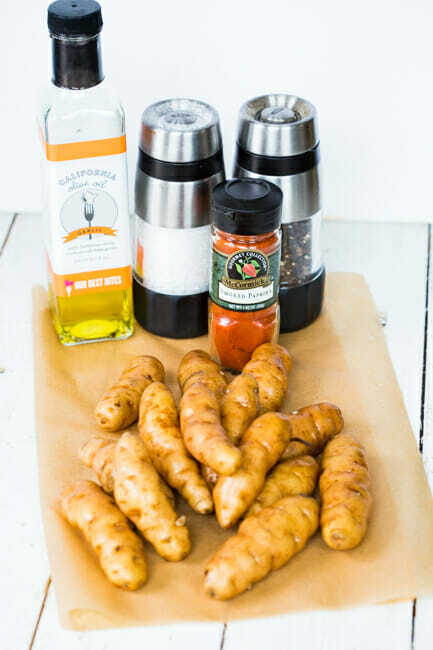 You’re also going to need garlic olive oil (I used the Our Best Bites Garlic Olive Oil, which by the way is on sale through TODAY! 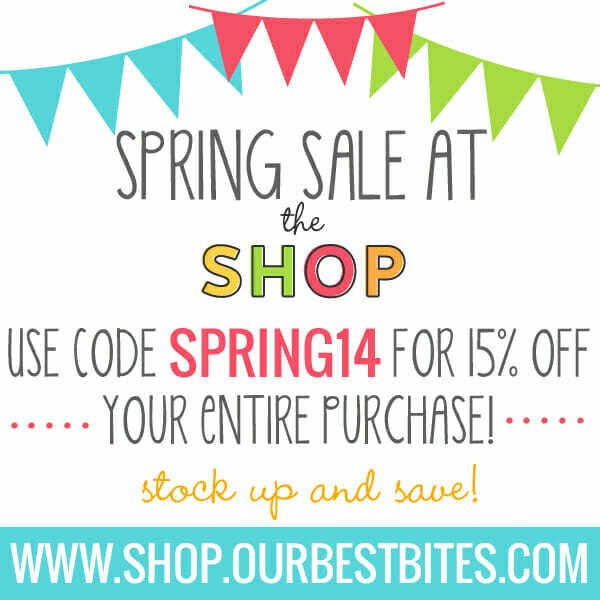 Use code Spring14 for 15%, here), kosher salt, freshly ground black pepper, and smoked paprika. Bring a large pot of salted water to a boil. 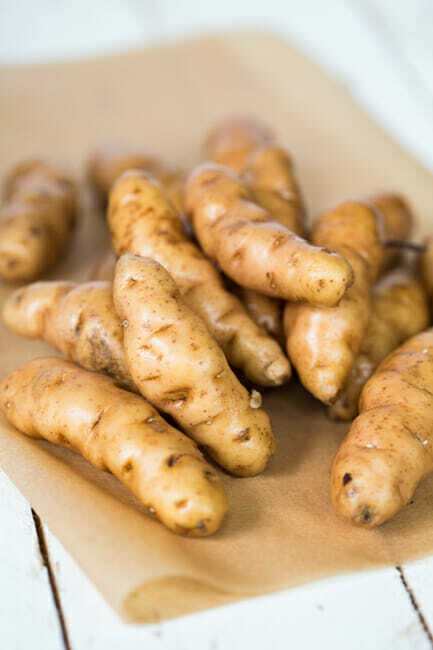 Wash the potatoes and, when the water starts to boil, place the potatoes in the water and boil for 12-15 minutes or until you can cut them with a wooden spoon or spatula. Drain. In a large skillet, heat 1 1/2 tablespoons garlic olive oil over medium-high heat. When very hot, add the potatoes and quickly stir to coat them in the hot oil. 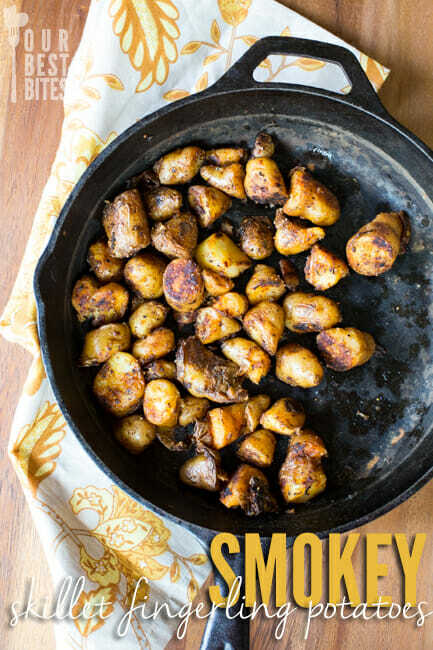 Using a wooden spatula or spoon, break the potatoes into bite-sized pieces. Season with salt, pepper, and smoked paprika and toss to combine. Allow them to cook, not stirring, until they begin to get crispy and a little bit blackened. Flip and cook on the other side until crispy and lightly blackened. Serve immediately. Can be served with just about anything–grilled steak, chicken, or fish for dinner, or with bacon or sausage and eggs for breakfast. Makes 4 servings. In a large skillet, heat 1 1/2 tablespoons garlic olive oil over medium-high heat. When very hot, add the potatoes and quickly stir to coat them in the hot oil. Using a wooden spatula or spoon, break the potatoes into bite-sized pieces. Season with salt, pepper, and smoked paprika and toss to combine. Allow them to cook, not stirring, until they begin to get crispy and a little bit blackened. Flip and cook on the other side until crispy and blackened. Serve immediately. Can be served with just about anything–grilled steak, chicken, or fish for dinner, or with bacon or sausage and eggs for breakfast. Makes 4 servings. 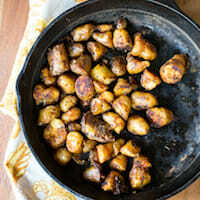 I’ve never bought fingerling potatoes but now I wish I had some to make this for lunch. When you say sometimes they are super cheap, what’s a good price for them? I know that varies by location, but what’s a general range? I would say when they’re around the same price (or cheaper) than baby red potatoes. My general rule of thumb is that if I have a hard time finding them, they’re going to be expensive and not very good, anyway (kind of like watermelons). When they’re cheap and abundant is when they’re at their best. I have a major weakness for potatoes in cast-iron skillets. I bet the garlic olive oil takes them over the top, too! Thank you for sharing! I know what we are having for dinner tonight! !